Sen. Tom Udall (D., N.M.) and Rep. Raul Grijalva (D., Ariz.) are trying to use the current budget crisis to push additional fees on the mining industry. The legislators are attempting to force miners to pay 12.5 percent in royalties to the federal government for profiting from public lands, according to the Washington Post. Two Democratic lawmakers are hoping public concerns over the economy and the "fiscal cliff" will reinvigorate a movement on Capitol Hill to reform the General Mining Act of 1872, which exempted mining companies from paying royalties for profiting from U.S. public lands. They want miners to pay the same 12.5 percent in royalties as oil companies, a move that could bring hundreds of millions of dollars in new annual revenue. The 1872 law "was designed to perpetuate the ‘go west, young man’ idea to bring people, commerce and industry to the West. But that’s done, it’s the new West now," said Rep. Raul Grijalva, D-Ariz., who along with Sen. Tom Udall, D-New Mexico, requested the GAO study. 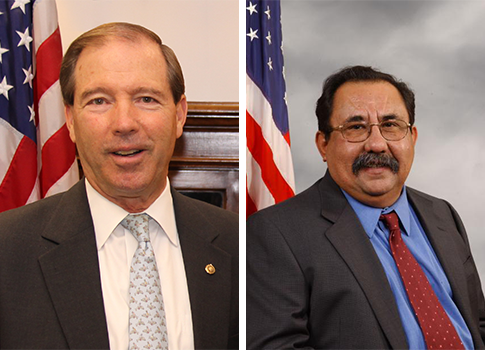 Udall and Grijalva have faced recent opponents who received donations from the mining industry. Udall and Grijalva now want to collect royalties on those same companies that supported their rivals. Rep. Steve Pearce (R., N.M.), who faced Udall in the 2008 election, received significant support from the mining industry. Freeport-McMoRan Copper & Gold, the world’s largest publicly traded copper mining company, was one of Pearce’s top contributors in 2008. Augusta Resource and Rosemont Copper, a company that pledged to add 2,900 jobs and inject $19 billion into Arizona’s economy, were among the top contributors to Republican Gabriela Saucedo Mercer’s 2012 campaign against Grijalva. This entry was posted in Politics and tagged Congress, Raul Grijalva. Bookmark the permalink.